This is a post by 瑠威 明 Francesco Matsuo. Lui is Japanese, FtM, was born in Japan and raised all over the world. He was raised in a very conservative Buddhist family in a Shinto environment. Early in his life, he had an urge to become a Capuchin Franciscan or a Franciscan monk. However, due to his gender identity, he is still looking for any order that will accept him as who he is. On one occasion back in Japan, I was blessed with the chance to visit a traditional dye house in old capital Nara. Nara is the older capital before Tokyo, and even before Kyoto was selected as Nation’s Capital. Nara was capital back in the year 710 up until about 794, the time the capital was moved to Kyoto for the first time. The dye house was a traditional one, so they showed how each silk was dyed by the hands of professionals. The lady who showed me around asked me what I would use to dye the silk a gentle tint of pink. The only thing that is pink that I knew of and could be used to dye the silk that came to my mind was Sakura flowers, since at the time the season was spring. I thought, “To dye it Sakura color you would dye with Sakura flowers!” She gave me a big winning smile and said, “You’d think so, right? But, interestingly, that’s wrong!” That grabbed my curiosity. I guessed again this time with, “Cherry or cherry seed!”, and I got it wrong again. Back in early grade school I didn’t know that edible cherries didn’t come from the Sakura, even though Cherry (Sakurannbo) in Japanese has “Sakura” in its name! The lady with a kind smile told me that if we dye silk in Sakura flowers it becomes the light green of the new leaves that come after all the flowers shed have to the ground. “The tree and branches in summer would carry the earthly colors like the carpet of fallen leaves in autumn,” she continued, giving me a hint. 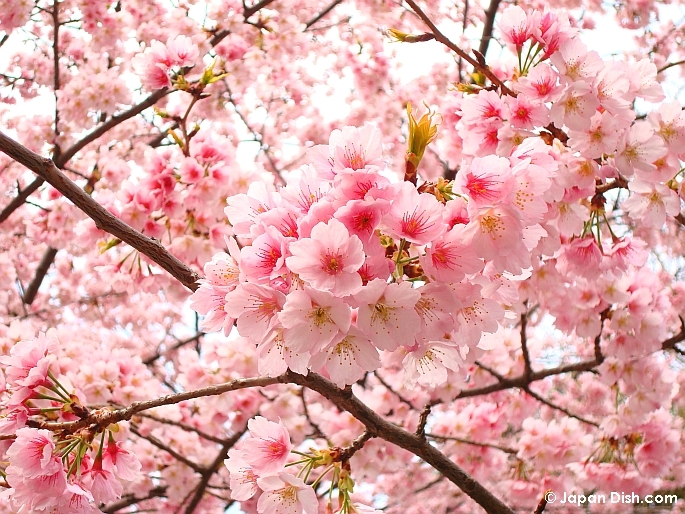 I realized that the Sakura held the future season within, always preparing for the next one. So I said it had to be new branches that come in winter! She gave a big hug and told me I got it right that time. It’s amazing that the plants know what season comes up next and prepares for it within their bodies. I remember being astonished by the fact, I even remember asking each Sakura tree as I passed, ”How do you know when you don’t even have a brain?” Of course the trees didn’t answer me, but I kept on asking, because I wanted to know how. In the original writings of St. Francis, which later became the rule for his order, he asked us to be joyful at all times, and never appear sad or gloomy on the outside. It is one of the toughest challenges St. Francis gave me. But, with the teaching of my dear Sister Sakura, hopefully I will overcome the tough tides that come and go as I take my life’s journey. This entry was posted in LGBTQ, Spirituality and tagged hope, springtime, st. francis by saholst. Bookmark the permalink.